Sponge cake, fresh banana cream with choco ganage. Curious George is the protagonist of a series of popular children's books by the same name, written by Hans Augusto Rey and Margret Rey. The books feature a curious brown monkey named George, who is brought from his home in Africa by "The Man with The Yellow Hat" to live with him in a big city. When the first story, Cecily G. and the Nine Monkeys was published in France in 1939, George was named Fifi. In the United Kingdom, George was originally called "Zozo" in 1941, apparently to avoid using the name of the then King George VI for a monkey. Books featuring the adventures of Curious George have been translated from the original French into many other languages in addition to English. The books are popular worldwide. 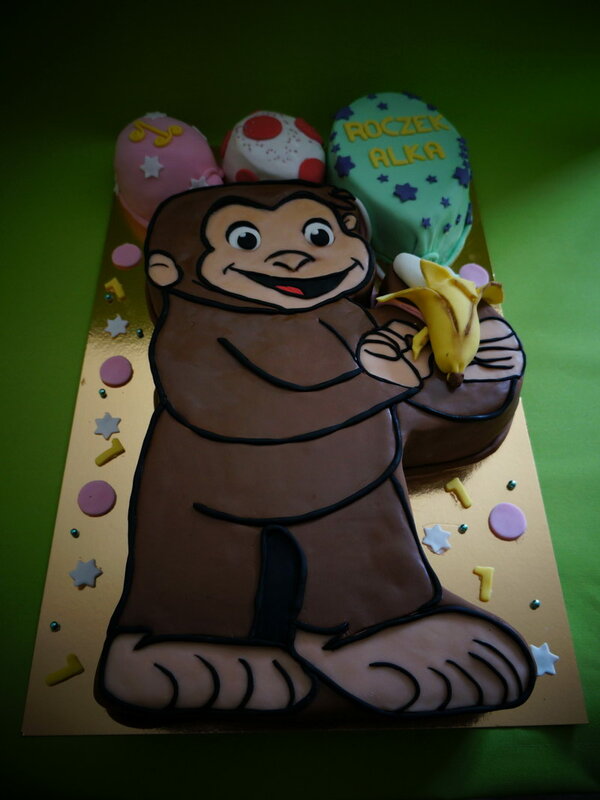 Pink Cake Land ©™ Birthday Cakes Delivered in London and Surrey UK.